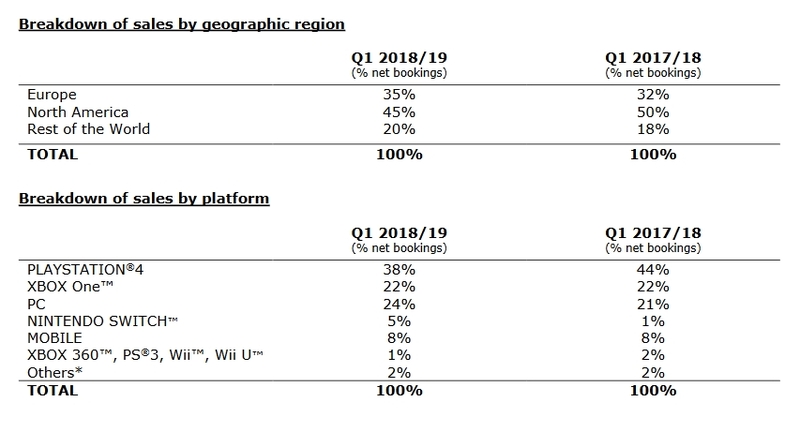 The first quarter of the 2018-2019 financial year has been good for the French developer and publisher. Indeed, Ubisoft (EPA:UBI) have reported that Q1, ending June 30th, has been the best first quarter in the company’s history. Sales for the company reached €400 million in the first quarter, with net bookings of €381.5m. This is almost double, an 88.8% increase to be exact, on last years results. Ubisoft’s target for the quarter was roughly €350m. This has been fuelled particularly by the ‘games as a service’ practice the company is following. We had a record first quarter, which exceeded our expectations. This performance was fueled by steady growth for our back-catalog and an excellent momentum for PRI (player recurring investment), once again confirming the increasingly recurring profile of our business and the ever-greater success of our digital transformation. PRI, as Yves Guillemot mentioned, includes the sales of digital items, DLC, season passes, subscriptions and advertising. This has been a core driver in Ubisoft’s growth, particularly when titles like Rainbow Six: Siege and For Honor have a user base in the tens of millions, a large number who pay for the additional seasons when released. Indeed, as a result of this, sales from the back catalogue and digital sales rose dramatically. The back catalogue is the core feature, having risen 74.7% over last year, generating €332.6m. The back catalogue also accounted for 87.2% of net bookings, though this is down from last years 94.3%. Digital sales were up 76.7% to €287m and made up 75.2% of total net bookings, lower than last year’s 80.4%. The fall in share for both the back catalogue and digital highlights a strong showing from the current catalogue of titles, namely Far Cry 5 which released at the very end of the last financial year. Ubisoft has also seen a fairly clear division in sales by platform and region. By region, North America saw a decline of 5%, but still brought in 45% of total sales. Europe generated 35% with the rest of the world bringing in the remaining 20%. One vindicating factor for me, as a PC gamer first and foremost, is the role of the PC in sales. The PC has grown in sales, from 21% last year to 24% this year. The largest fall came from the PlayStation 4, which fell from 44% last year to 38% this year. Mobile sales remain consistent, generating 8% of total sales for the company. Understandably, Ubisoft is optimistic for the coming quarter and for the financial year as a whole. The second quarter, in particular, is hopeful to be a strong one as a result of further back catalogue sales. In addition to this are in-store shipments of Assassin’s Creed Odyssey. Second quarter sales are expected to be between €345 and €350m, with bookings of €345m. This would be a large increase on last years €264.2 million of bookings. Ubisoft has also stood by yearly targets of sales of roughly €2 billion, with bookings of around €2.05bn. Operating income from this would be around €440m. This is certainly a feasible target for the company, particularly so with the number of upcoming titles. As well as the aforementioned Assassin’s Creed Odyssey, Ubisoft also have The Division 2, Starlink: Battle for Atlas. Potentially, Beyond Good and Evil 2 could also feature within the current financial year, though likely not. Regardless, Ubisoft has a strong back catalogue of titles they are performing well with, especially as they continue to release new content for titles like Rainbow Six: Siege and For Honor. In addition to this, games like South Park: The Stick of Truth will be re-released on the Nintendo Switch, further helping with sales. The future is certainly looking bright for Ubisoft.